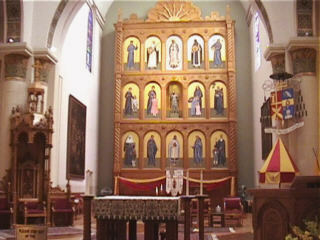 Unlike Loretto Chapel, St. Francis Cathedral is still part of the Santa Fe Archdiocese. As we entered the church there was a sign listing rules of conduct. My favorite one was "Do not toss coins into Baptismal Font". Traci and I spent a few minutes walking around the beautiful interior admiring the stained glass windows and altar paintings. There were people praying and some lighting candles but I was distracted from this serene environment by the echoing voice of some guy sitting in a pew talking on his cell phone. After leaving St. Francis Cathedral, we resumed the hunt for Traci's jewelry set, visiting shop after shop until around 4 PM when the shopkeepers begin closing for the day. Unfortunately, Traci was not able to find what she was looking for. However, she was happy to find out she got a great price on the sterling silver necklace she bought at the Indian Pueblo Cultural Center in Albuquerque the day before. Similar necklaces in Santa Fe were being sold as much as four times the price she paid. With the Plaza businesses closing for the day, we decided it was a good time to find the Homewood Suites Santa Fe Hotel, our lodging for the next two nights. 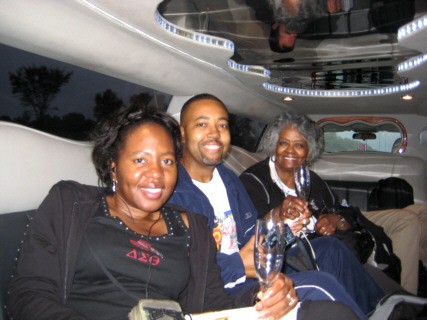 Traci and I have got to send out a big THANK YOU to my world-traveling co-workers, Evette and Kesha. After their Santa Fe vacation a few months before ours, they told us about the Homewood Suites and the nice company discount we get when we stay there on leisure travel. 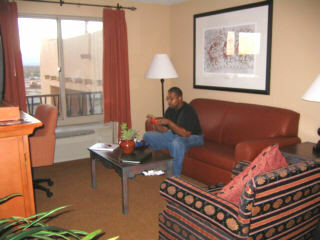 Our two nights at the Homewood Suites cost less than one night at La Fonda. Furthermore, breakfast and a light dinner were included everyday at the Homewood. 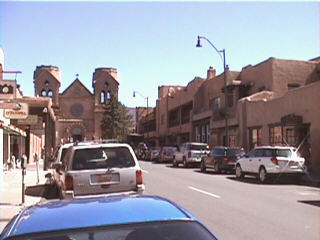 The hotel is located within the Pojoaque Pueblo territory about 15 miles north of the Plaza. It has a Native American theme inside and out. There are paintings and sculptures of nature throughout the premises, all labeled "Courtesy of the Poeh Museum". Like all the accommodations in the hotel, ours had a living room, kitchen, and bedroom. In-room internet access is free. Other than the golf course, there is pretty much nothing near the hotel - at least not in walking distance. This will change in 2008 with the completion of a large Hilton casino on the premises. Construction was in full swing while we were there. Dinner (a.k.a. Welcome Home Reception) was being served when we arrived at the Homewood. On the menu that night was a salad bar and chili with corn chips. Oh, I can't forget about the sinfully good cookies. Delicious! After dinner, Traci and I chilled out in our room checking email, reading travel brochures, and playing Scrabble on her Palm Pilot. Looking out our window that evening was a treat for me. As I looked across the desert I could see the sun sink down behind the distant mountains leaving the bright full moon to illuminate the dusk sky. All that was needed to complete this classic western scene would have been the silhouette of a coyote howling at the moon. 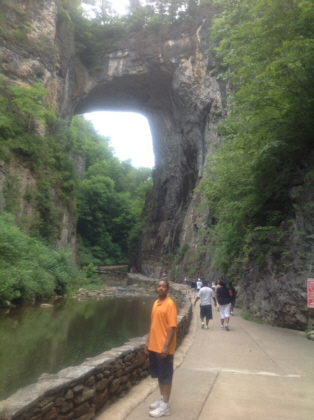 Tuesday was our day to enjoy the Great Outdoors. 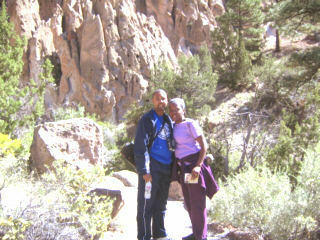 We took a half hour drive to Bandelier National Monument. This park is known for its ancient Indian dwellings as well as its spectacular canyons. 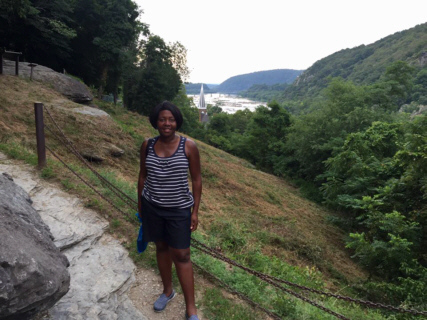 Traci and I decided to do the 1-mile Main Loop Trail that begins and ends at the visitor center. A park ranger narrated the first 1/4 mile and then left us to explore on our own. I was glad we did the guided portion of the hike; otherwise, we would have walked by so many treasures without knowing the significance. 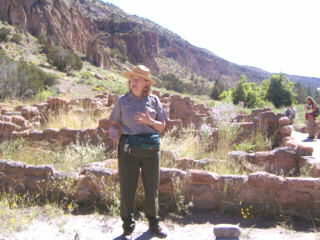 The ranger pointed out different types of volcanic rocks that had uses such as arrow heads and carving tools. She showed the many uses of the yucca plant. For example, the Indians used it as soap. She showed us how the roots become sudsy when added to water. 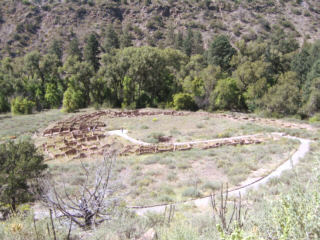 We were shown a large round, stone-walled pit in the ground called a kiva. It is believed the Indians used this for ceremonies and meetings. In addition to ground dwellings, the Indians also carved homes into the rocky cliffs. 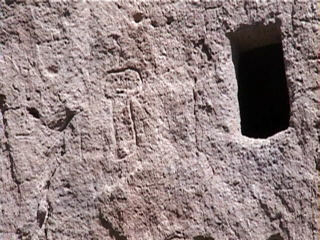 They etched pictures of people and nature into the outer walls. These pictures became easier to spot after the ranger pointed out one. 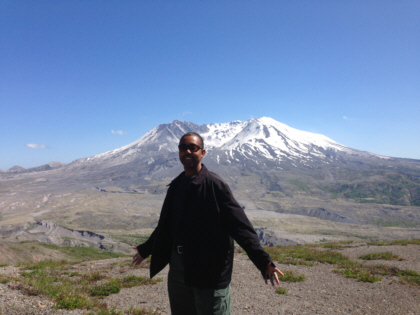 It is amazing that these sites still exist after hundreds of years. The ranger concluded her tour after about 20 minutes and left us alone to travel the rest of the trail. 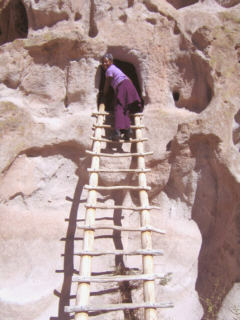 We climbed ladders to take a peek inside some of the cliff dwellings. You can still see the burn marks on the ceilings from the fires the Indians used hundreds of years ago. We continued along the path trying to spot more rock drawings. 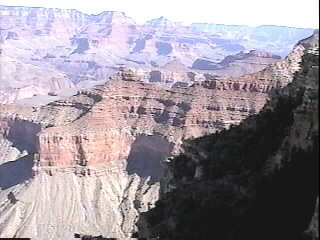 It is believed there are thousands of sites like this throughout the park but the local tribal elders have not granted permission to the park services to excavate them. 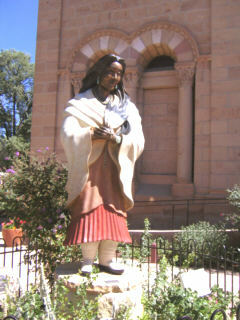 The sites are sacred to the local pueblo and thus remain undisturbed. Our hike concluded with a 1/4-mile walk through a wooded area with a running stream. The weather was gorgeous that day and the walk was totally refreshing. We finished off our visit to Bandelier National Monument at the gift shop where Traci searched in vain for her ideal jewelry set. 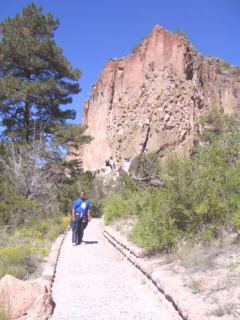 From Bandelier, we drove 45 minutes south to Santa Fe where we visited the Museum of International Folk Art. This museum is a tribute to the common or folk people from around the world. We started off at the Girard Wing. Alexander Girard collected figureens and dolls from all over the world and put them on display in a huge room inside the museum. The pieces are displayed in detailed scenery much like a model railroad layout. There are replicas of Spanish marketplaces, African street scenes, European formal dinners, castles, and more. Some of these scenes contain hundreds of figureens.